Such claims are indeed valid and are verifiable by looking at some of the disgusting content that had been put out by the group via posters, tweets , and hate preaching speeches made by some of their especially twisted members. For instance, if one were inclined to boil their blood for four and a half minutes, watch a nauseating speech from NA’s former member Jack Andrew Renshaw, (whether former NA members still gather in the name of the organisation underground is obviously unknown to the author). The group’s former spokesperson Benjamin Raymond had expressed ambitions to maintain his ex-NA contacts raising concerns that former members of the group will start a new fascist organization and continue campaigning on the same ideological line of NA. (Unfortunately the video cited for this claim had been removed by Youtube due to legal complaint from the UK government.) The far right is alive and well in the UK and seems to be growing; proving a greater threat to the British liberal establishment and indicating that the first world left’s tactics in the UK are failing. 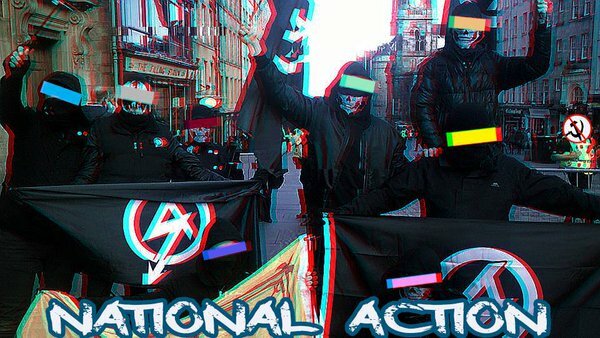 For example, in 2010 the far right British National Party ‘BNP’ (now divided into several splinter groups, NA recruited many members from the BNP youth wing) managed to gain 2 members in European parliament, a damn sight higher than any ‘Communist’ party from the revisionist and first worldist Communist Party of Britain and Communist Party of Great Britain Marxist/Leninist. The reason to emphasise the point of Amber Rudd’s accusation of NA being racist, homophobic, and anti-Semitic is that such terms have lost much of their power due to their overuse by the first world left. For far too long the first world ‘left’ and liberal groups have relied on this “call out culture” and identity politics to gather some form of ‘stand-in proletariat.’ This extremely anti-materialist, and frankly weak, attempt to substitute the long dead western proletariat with oppressed minority groups within the first world as a base for revolution fails theoretically and practically. Moreover, when there actually IS an anti-semetic, racist, fascist, homophobic organisation like the NA, “calling them out” no longer has the same meaning or effect that it should. Of course, people living in the first world can be oppressed based on their identity, and indeed horrible groups like NA wish to establish regimes that oppress and even massacre groups according to their identity. All communists who are serious about revolution should fight to abolish all oppression, be it in the form of exploitation or identity oppression, in the fist or the third world. This is why Leading Light Communists are, and will always be, in a state of conflict against fascists like NA. However, a major error of the first world left is that their appeals to identity oppression in the first world are placed above the primary oppression; that is the exploitation of third world peoples. Hence this “call out culture” based on screaming ‘Fascist!’ ‘Racist!’ ‘Homophobe!’ that has possessed and sabotaged the first world left. Because of this culture, leftists in the first world have earned a reputation of being a bunch of immature name callers and whiners rather than people who are willing to engage in meaningful dialogue or struggle. Ironically, more often than not their “call out” ire is directed towards their fellow travelers rather than their professed enemies. This ultimately plays into the hands of the far right. This is no shock to the LLCO, for Leading Lights understand that the first world will always lean more towards the far-right than the far-left for as long as it exists. How can an egalitarian redistribution of wealth benefit first world people on a global scale? The vast majority of people in the first world only care about maintaining their share of the stolen pie away from the third world peoples who wish to take it back. They better prepare themselves. Leading Lights across the globe will surround and cut off the first world from its plunder. All those who oppose this global reconstruction from neo-nazis to social-democrats will be swept away by the great storm of Leading Light Communism along with the rest of Old Power to make way for a peaceful, harmonious and sustainable New Power!